The second semester after Hurricane Maria has been quite exasperating. Trying to get work done in this condition has been challenging. Amazingly, the interns have been able to get passed their trials and move to the finish point. I have been working on the economics of climate. This topic is very interesting because there are so many things to look at. It has also given me the opportunity to grow and learn many new things. One aspect of this project is poverty. I was able to get a deeper understanding of poverty and how individuals who live in poverty do not actually believe that they are poor. One of the task which has to be done for this topic is film video with various persons. I earnestly looked for individuals to interview to get a grasp of their point of view on the topic poverty. However, many have declined. It seemed like I wouldn’t get someone, but, after many attempts someone finally accepted. Filming for that video was really great. I was really happy that I was getting some work done. 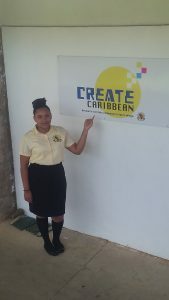 Being at Create Caribbean has awakened a new interest in me: Information Technology. Another project which I have had my eye on was finally assigned to me. I always wanted to get involved in mapping on the Carisealand page. I was able to that and it has been really awesome. Getting an understanding of software and different things that I can do with my computer has delighted me.